Feeling frazzled? Stress and anxiety affect our mental and physical health in some pretty profound ways. 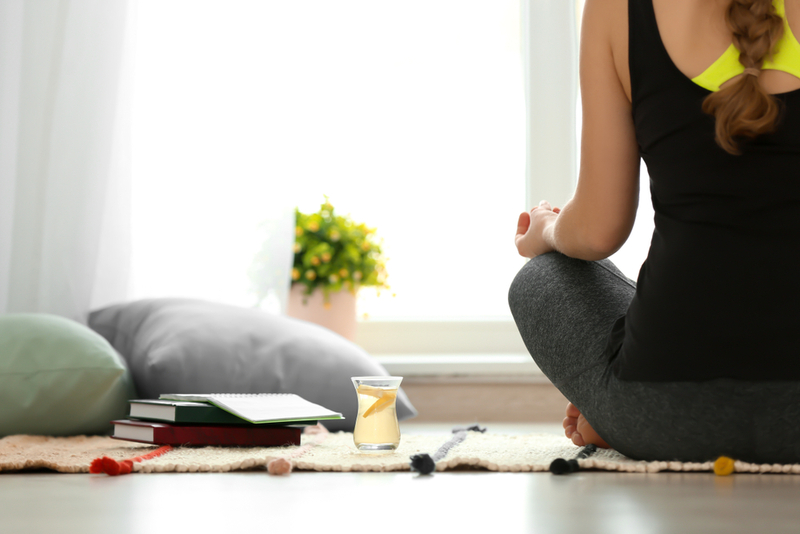 If the daily grind is wreaking havoc on your happiness and health, we’d like to recommend a tried-and-true anxiety-taming trio: yoga, meditation, and tea! Whether you’re struggling to get enough sleep due to a racing mind, or your ever-growing to-do list makes you want to crawl under the covers, tweaking your daily routine could make a massive difference. Below, we highlight a few small changes to your daily routine that could help relieve stress, lessen anxiety, and lead to a healthier, happier you! If you rush through your morning routine while gulping cup after cup of java, you’re setting yourself up for an inevitable crash later in the day. Pay close attention to your energy level and mood as the caffeine leaves your system, and you’ll likely experience a noticeable dip. There’s a scientific explanation as to why this happens. The body produces extra adrenaline and dopamine when we consume caffeine. As these chemical levels drop, so do our energy and mood. Herbal, caffeine-free teas are hydrating. We need proper hydration to maintain balanced body fluids. In addition to keeping our body’s systems functioning properly, staying hydrated helps the mind perform at its best. Less caffeine = Less anxiety. If you rely on a double shot of espresso to make it through hectic mornings, the caffeine could be causing jitters, anxiety, and even adrenal fatigue, which can lead to long term health implications. Switching to herbal tea can help alleviate that uncomfortable, nervous feeling, particularly if you’re easily overwhelmed. Pukka Three Cinnamon Tea – This organic blend combines Indian, Indonesian, and Vietnamese cinnamon. It’s truly a delight to drink first think in the morning. Cinnamon is known to balance blood sugar, so this blend will likely keep you on an even keel throughout the day. Tick Tock Rooibos Green Tea – Naturally caffeine-free with a lovely fresh taste, this British favorite is subtle and slightly sweet, allowing your taste buds, body, and mind to wake up slowly. Best of all, you’ll get a slight energy boost without the jittery side effects. Twinings of London Lemon & Ginger Tea – When you’re in need of a pick-me-up, this naturally caffeine-free blend is sure to invigorate your senses. The zesty flavor and aroma will wake you up and carry you through your morning. We’re particularly fond of mindfulness meditation. Studies show that a mindfulness meditation practice decreases stress, helps us cope with illness, and can aid in recovery. Mindfulness has also been linked to decreased depression and improved overall health. Although meditation is an excellent way to start the day, feel free to practice when it’s best for you. There’s no right or wrong time! In addition to herbal tea and a meditation practice, incorporating yoga into your routine could lead to a less stressed you. According to Psychology Today, between 80 and 90-percent of visits to the doctor are related to stress. Although the vast majority of doctors don’t recommend meditation or yoga, studies show that they should! A national survey cited by Psychology Today notes that more than 85-percent of people who practiced yoga reported decreased stress. Because yoga incorporates both the mind and body, the benefits are virtually endless. The body’s stress hormone levels can actually drop with regular practice, leading to less stress and an overall sense of well-being. Adding herbal tea, meditation, and yoga into your daily routine can be life changing, but don’t underestimate the power of small changes over time. You might want to start with a cup of herbal tea in the morning and a quick yoga practice at night before bed. Modify your routine at your own pace, and most importantly, enjoy the process. About the Author: Joanna Thomas has been practicing yoga for over 20 years and teaches a Bikram class at her local gym. You can find more of her yoga-related articles over at Hobby Help.